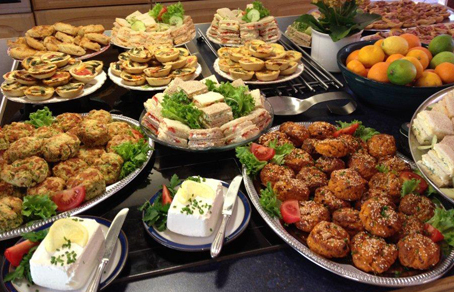 The Green Bean Catering Company offers clients bespoke catering for all occasions. From small private celebrations to large formal gatherings we pride ourselves on our personal and professional service. After more than 30 years experience we understand that every occasion is totally unique, so whatever the brief, we are happy to take care of every detail, even last minute bookings are not too much trouble. We cater for all private parties and corporate events, weddings, funerals, barbecues and children's parties and work closely with local suppliers so can also provide marquee's of any size, fully stocked outside bar, barbecues and hog roasts, entertainers, musicians and florists. We are based in Bletchingley, Surrey and cover all surrounding areas. We look forward to hearing from you and assure you of our best attention. We can accommodate any style of food to suit any occasion and all of our dishes are homemade using fresh locally sourced produce. Whether you would like eastern flavours, simple home cooking, classic French dishes or Mediterranean cuisine, we can adapt our style to suit you. Please contact us now for a no hassle discussion about your requirements. We pride ourselves on offering the very best customer service from the initial enquiry until we collect the last piece of cutlery once the occasion is over. If you would like to find out more and receive a no obligation quote and menu then please get in touch by either sending us an e-mail or giving us a call. Abinger Common, Abinger Hammer, Albury, Alfold Crossways, Ashtead, Banstead, Beare Green, Betchworth, Bletchingley, Blindley Heath, Brockham, Buckland, Burgh Heath, Burstow, Capel, Caterham, Chaldon, Charlwood, Chelsham, Chipstead, Claygate, Cobham, Coldharbour, Copthorne, COULSDON, Cranleigh, CRAWLEY, Crowhurst, Croydon, Dorking, Dormans Park, Dormansland, Downside, East Clandon, EAST GRINSTEAD, East Horsley, EDENBRIDGE, Effingham, Ellen's Green, Epsom, Esher, Ewell, Ewhurst, Ewhurst Green, Farleigh, Felbridge, Felcourt, Fetcham, Forest Green, FOREST ROW, Friday Street, Givons Grove, Godstone, Gomshall, Great Bookham, GUILDFORD, Haxted, Holland, Holmbury St Mary, Hookwood, Hooley, Horley, Horne, Jayes Park, Kenley, Kingswood, Leatherhead, Leigh, Limpsfield, Lingfield, Little Bookham, Long Ditton, Martyr's Green, Merstham, Mickleham, Newchapel, Newdigate, Newland's Corner, North Holmwood, Norwood Hill, Nutfield, Oakwoodhill, Ockham, Ockley, Outwood, Oxshott, Oxted, Parkgate, Pebble Coombe, PURLEY, Redhill, Reigate, Ridge Green, Salfords, Shere, Shipley Bridge, Shirley Hills, Smallfield, South Godstone, South Holmwood, South Nutfield, Stoke D'abernon, Surbiton, Sutton, Sutton Green, Tadworth, Tandridge, Tatsfield, Thames Ditton, The Hermitage, Titsey, Walliswood, Walton On The Hill, Warlingham, West Horsley, Westcott, Westhumble, Whyteleafe, Woldingham, Wotton and everywhere inbetween. © 2015 Green Bean Catering. All rights reserved.